Important: SLStreamCapture is an additional option that is separately purchased. 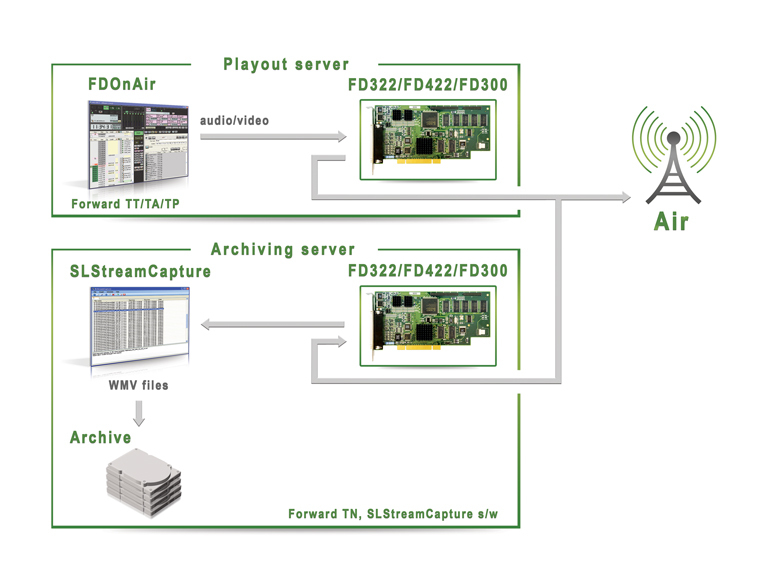 The SLStreamCapture software is designed for archiving of TV channels broadcasting. 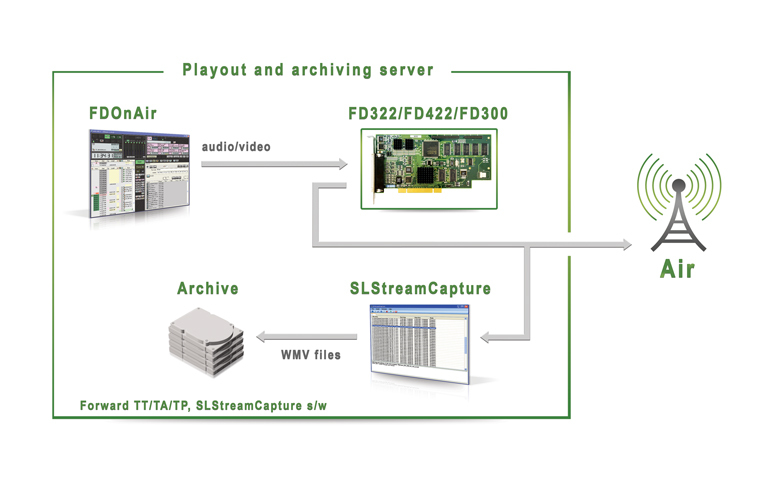 There are single-channel (from 1 input/output of the FD322/FD422/FD842 board, the SLStreamCapture license) and dual-channel (from 2 inputs of the FD322/FD422/FD842 board, the SLStreamCapture2 license) versions of the plugin. SLStreamCapture has the following scheme: client/server. Client application can be closed when record is configured. However, recording will be automatically implemented. It allows air recording in case of PC emergent rebooting. Recording can be organized in different ways. SLStreamCapture is located on the same PC from which broadcasting is implemented. Recording will be executed from the FD322/FD422/FD842 board output in this case. SLStreamCapture is located on PC from which broadcasting is not implemented. The I/O board FD322/FD422/FD842 is plugged to the archive PC in this case. Another board (the additional one) is used for receiving of analog signal. Recording is executed from the FD322/FD422/FD842 board input. SLStreamCapture2 can be installed on PC from which broadcasting is not implemented to record several channels. The FD322/FD422/FD842 board is installed on archiving PC in this case. Another board (the additional one) is used for receiving of analog signals. 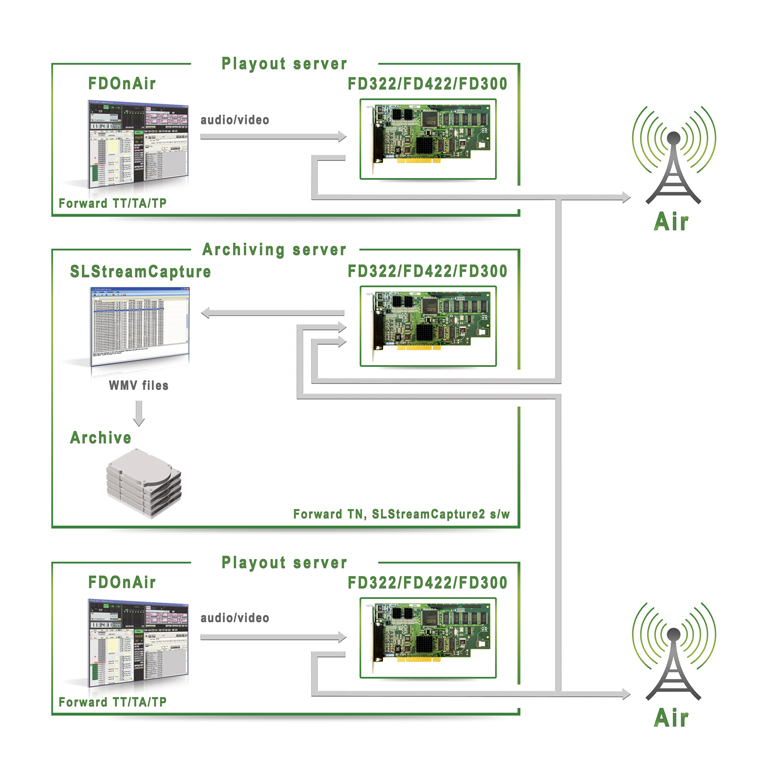 Recording is executed from 2 inputs of FD322/FD422/FD842 boards. Recorded files can be played at any PC with Windows. There won't be any difficulties caused by impossible playback of files because of a lack of the corresponding codec. Material recorded by any TV company must be stored during a specific period under the law. 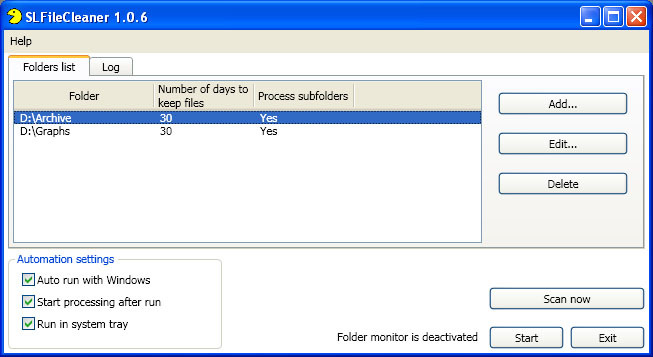 SLFileCleaner application deletes automatically files whose storage time is expired. deleting of files both - manually/automatically. For more detailed information contact Support. Information on prices can be found in the "Where to buy" section. You can download a current version of plugins software in the "Download" section. Detailed information on plugins is available in the "Documentation" section.